The Lounge is available to hire from 6pm weekdays and all day at weekends. It's a great space for networking events and drinks receptions with a capacity up to 250 standing. The space can also be hired for sit-down dinner events or hackathons for up to 70 people. With a mix of fixed carriage-style innovation pods, bespoke high tables, and low comfortable seating, the Lounge is a flexible space for a variety of events. 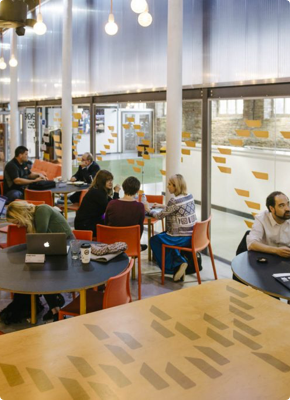 The space is used by members as coworking space during the day. Engine Shed is home to over 30 resident companies and provides a venue for over 1200 meetings & events every year. It's our bread and butter. We love to host events, new residents and coworkers to Engine Shed. Get in touch today for more information. 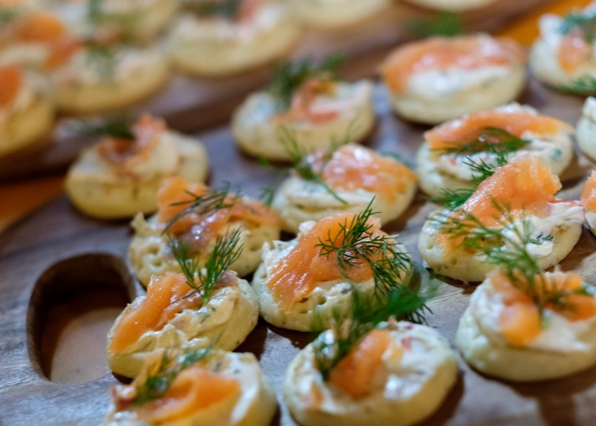 Our catering partner, Caffe Gusto, can provide a full variety of options for your meetings and events at Engine Shed, from breakfast pastries, to buffet lunches, evening canapés, and a range of drinks. Their menu gives full details of what is on offer. Just let us know what you’d like to eat and drink, and we will place your order on your behalf when your room booking is secured. THANK YOU! It was an amazing event, which I’m so pleased ran so smoothly. We’ve had fantastic feedback from attendees, as well as The Royal Household, so we’re all really pleased!